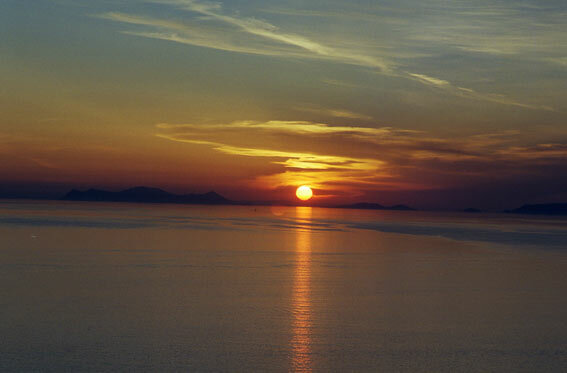 Hotel Sunset is equiped with nine rooms with a spectacular view at the volcano and on the sea of Mediterranean. 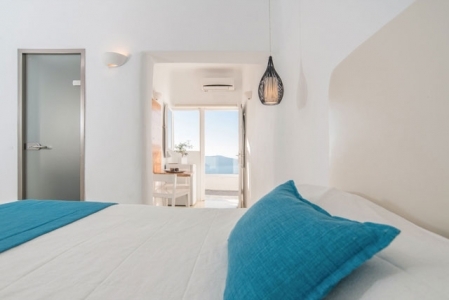 If you want to enjoy the most spectacular sunset of the world, if you love the hospitality and the familiary environment in your vacation, come to lava's island, Santorini. In Firostefani, on the edge of caldera we have created for you a small traditional hotel 700 meter from center. No fee charged if cancelled 14 days before arrival date. Cancelled within 14 days before arrival will result in the first night charge. In case of Non Show will result in the first two nights charge. Santorini is the last of the Cyclades island to the South. The closests islands are Ios, Folegandros, Sikinos to the North, Anafi and Amorgos to the East and Crete to the South. We refer to Santorini as one, but actually is complex of five islands. Santorini (Thira) is the main island and around it Thirasia and Aspronisi (parts of the ancient Stroggili) and the two volcanic islands Palea Kameni and Nea Kameni. It was one island named Stroggili (circle in Greek) until about 1645 BC, when the volcano in the middle of the island erupted and Caldera was created. The two volcanic islands appeared much later from various eruptions starting 157 BC and the last one to be in the 20th century (1950). Santorini is connected to Piraeus, Thessaloniki, Crete, Rhodes, Kos and all the major Cyclades islands (Mykonos, Paros, Naxos, Ios, Sifnos, Milos, Tinos, Syros) by boat and Athens and many countries direct by plane. After staying at this hotel I was very impressed with the staff. Maria and Elsa were amazing servers, housekeepers and very friendly. The breakfast is very elaborate.The view is amazing! After leaving the hotel they contacted us to tell us we had left 180 Euros in our room. Very impressed and grateful! Thank you for a wonderful stay. Panaromic view. Very good price as well. One thing that stands out is the quality of the breakfast. One thing thay could have been improved is the shower. A better water pressure and a more stable flow of hot water. Other than that, I would recommend to anyone. The terrace is lovely, although some shade/pergola perhaps would be nice. 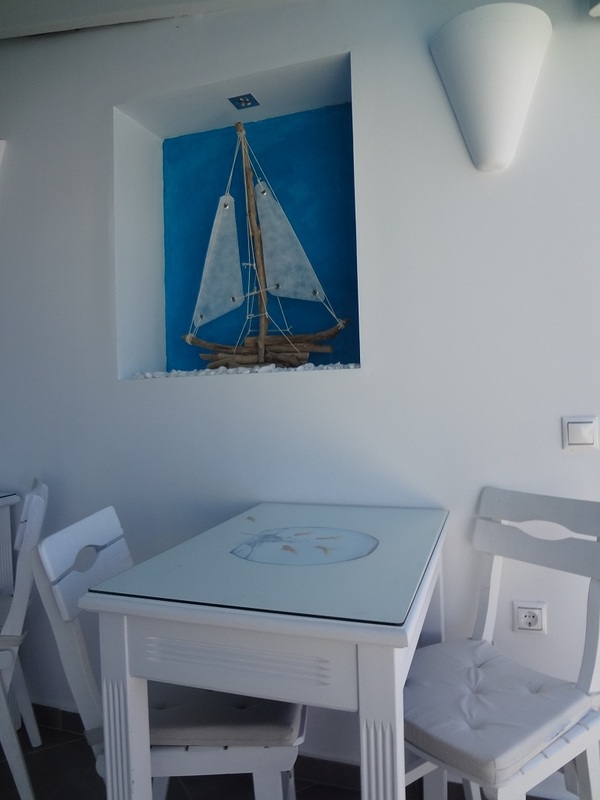 The rooms are comfortable and tastefully decorated. The view is amazing. It did smeel of sewage in the bathroom though. I would definitely both recommend and return. Thank you. All in all a lovely hotel. Really nice location, view and staff. Got an ATV rental sorted on arrival and the reception staff were extremely helpful. My friend and I stayed for 4 nights and it was amazing! 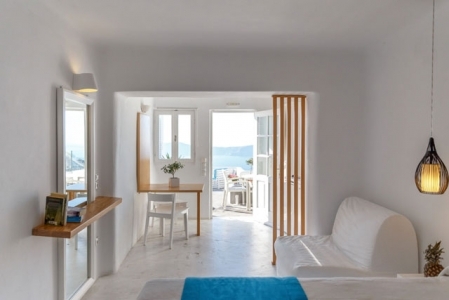 the location was perfect right in the center of fira Stefani and a 5 minute walk to fira. The hotel was great and the view from the balcony was something out of a movie. highly recommend for all! A little piece of haven!!! Very good location to view sunset and caldera. Very quiet during winter time. Should go in Fira for lunch and dinner but restaurants are not so far. Same breakfast every day. Cold bathroom. Not recommended in case you have heavy/big size baggage. Nice helpful staff at a great location and view. View from the patio was outstanding. Room was clean and comfortable (very good mattress). Only issue we had was competing for the couch seating on the patio which overlooks the caldera. A large group checked in the last night we were there and they pretty much took over the couches. Other than that I would highly recommend.